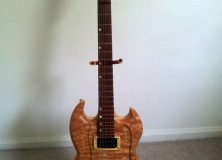 About a year ago I had done a hands on review of one of Eric Joseph’s guitars. At the time I had no clue what to expect, so it was a clean slate. 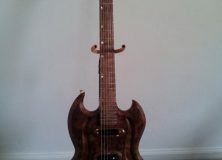 After playing the guitar I found it to have easily been among the best guitars I had ever played. This time around when the opportunity to play another one of his guitars arose it was everything I could do to sit in my chair and act like a level-headed citizen of planet Earth. Lets start with the details on what we’ve got here first. 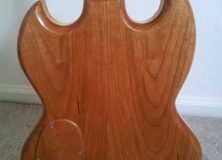 The guitar itself is built out of six different pieces of wood. 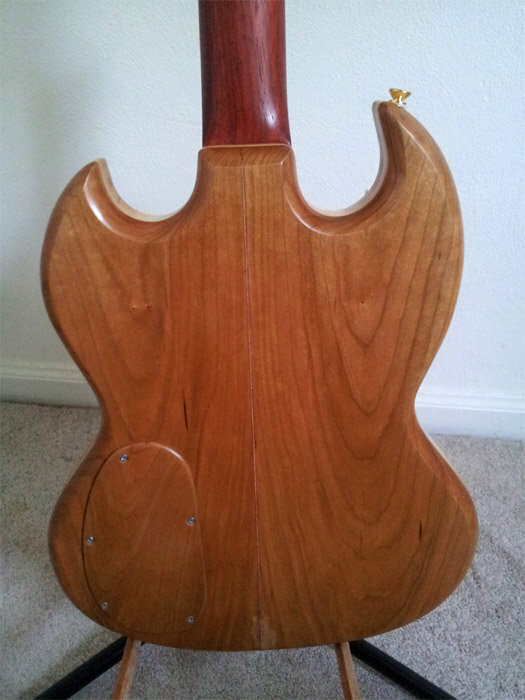 The body is fully chambered and uses an eastern US curly maple top, an eastern US cherrywood back, with a piece of basswood in the center. 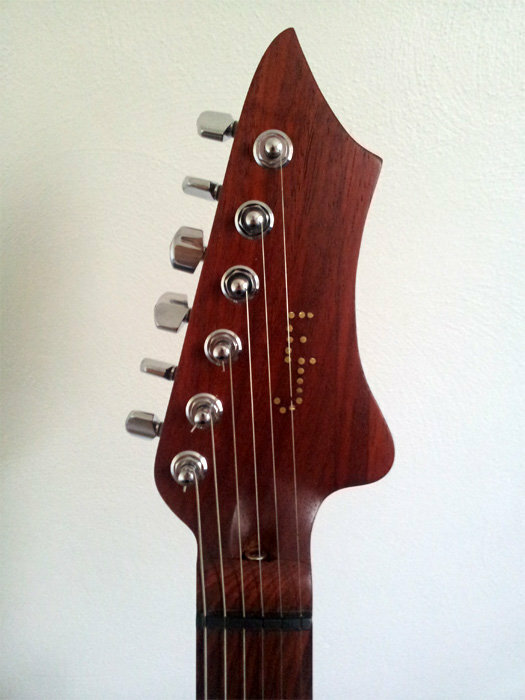 The set neck is hand-carved from African padouk with a Mexican cocobolo fretboard. 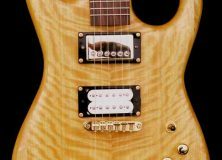 The pickup rings are carved out of yellowheart wood. All woods are finished with a penetrating polyurethane and carnauba wax finish. 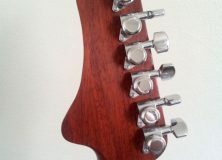 The standard hardware layout uses a Schaller non-tremolo roller bridge with a set of Schaller locking tuners, all in chrome. The standard pickup selection is a set of Railhammer Hyper Vintage humbuckers. Customizations including gold hardware are available, though the prices can vary. The last details a double-action truss rod, a tusq self-lubricating nut, and a Gator hardshell case. As I had mentioned earlier last time I had no idea what to expect. This time around I knew what I was getting into and my mouth began to water (with the pressure of a fire hose). The short of it is I wasn’t disappointed. 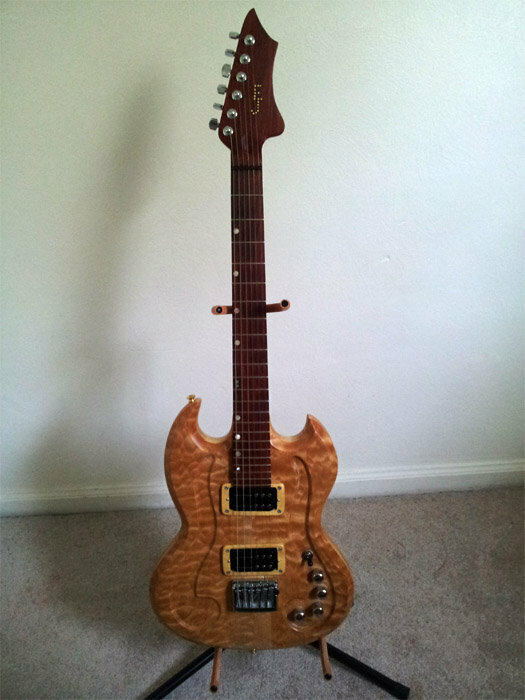 At 8 pounds it’s a bit lighter than my most used guitar (a Fender Strat). It has a very thick neck on it that, while thicker than my smaller hands can typically handle, still sits very comfortably in my hands. 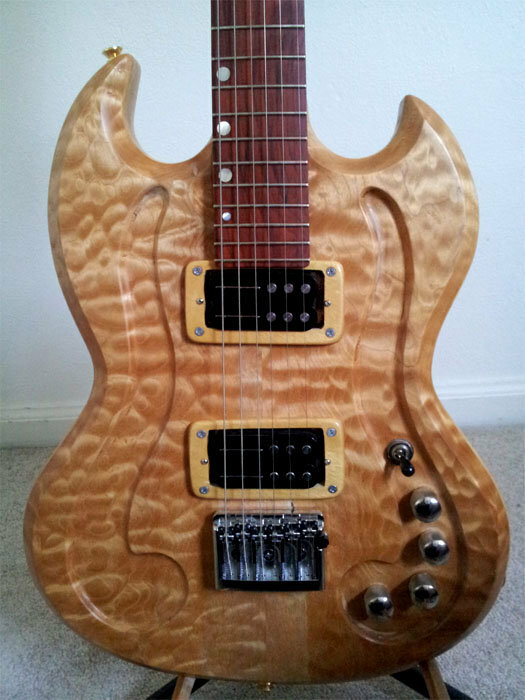 It’s carved masterfully and feels as silky smooth as you could hope and with a tasteful application of the finish and wax the guitar always feels like you’re holding an instrument made out of wood as opposed to some brands that get a bit eccentric with their paint jobs or clear coats and result in a more plastic feel. The Schaller fixed roller bridge is a sturdy piece of hardware and easy to adjust for bridge height, action, and intonation. 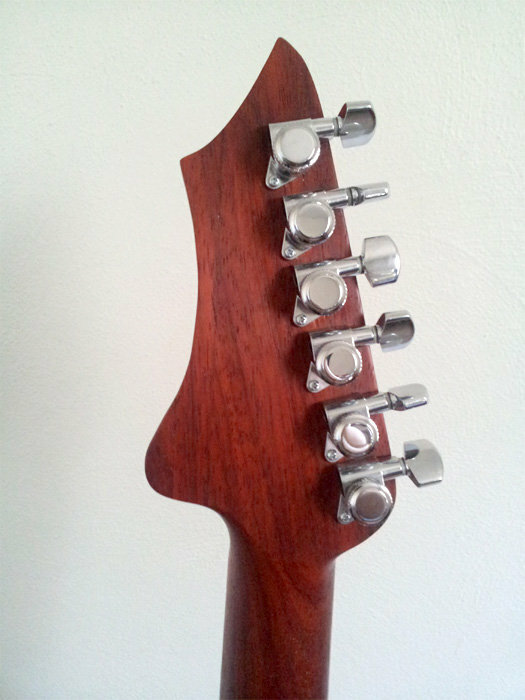 Couple that with the set of Schaller locking tuners and you’ve got a good setup to keep your strings in check. 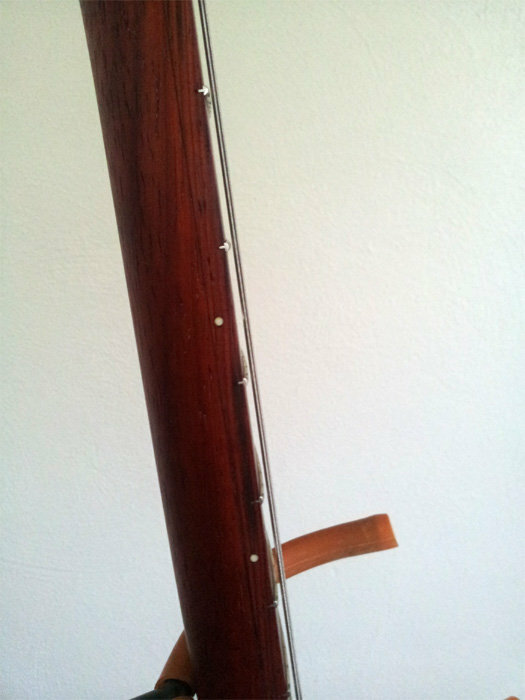 The only drawback I’ve really come across is the high fret access. 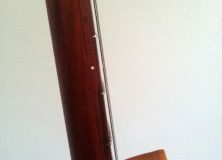 Given the body’s design the highest two frets are difficult for my 3 1/4” (at the longest) fingers to reach. While I can pull it off it’s not something I can just seamlessly fly into while on the go. 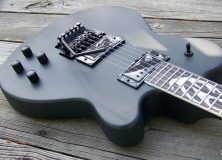 For the pickups Eric has turned to Railhammer’s Hyper Vintage model humbuckers. 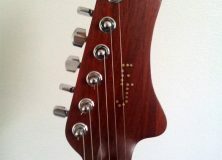 The unique design gives the low three strings rails while the higher three have the more common magnets. 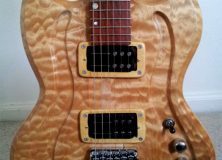 Between the wood and the pickups the guitar produces a very thick and warm sound while playing clean, though the pickups are hot and can get a bit of grit to the signal on their own. Any more dirt to the signal is a welcomed addition and the guitar handles it all while retaining its clarity. Given my experiences with Eric Joseph’s guitars I already knew what to expect. 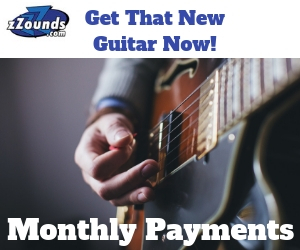 He makes great quality guitars that feel comfortable and sound great. This guitar is no different. The guitar rests satisfyingly in my wanting hands and the playability is as gratifying as one could hope. At $1,849 it feels adequately priced. If you ever have a chance to play one I strongly recommend it.